Known usually for their improvised space rock excursions, on their latest album the Minnesota quartet known as Salamander indulges in their occasional acoustic folk/psych explorations for an entire album. It is, however, true to their roots, very spacey folk music, combining drones and atmospherics with the acoustic guitars. 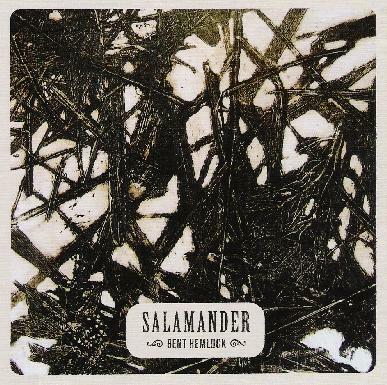 Salamander creates various types of different backing drones to blast out folk music that is definitely out on the edge. In the rollicking Portal, I really like the way they layer the frantic strumming acoustic guitars in the middle with deep, rumbling spacey textures underneath. And on The Visionary Kind some buzzing, distorted electric guitar hums along beneath the acoustic twang. They also work up some very cool, rumbling percussion lines like the pounding on the excellent, psychedelically electrified Call of the Hills. Tracks like Portal and the haunting opening track Galleon (featuring guest vocals by Madeline Westby) show the band has a good sense of melody too. The band even delves into exotic instrumental improvisation on the darkly spacey closing track, An Open Transom. This is gritty, psychedelic folk music in the purest sense. Well worth checking out. Contact via snail mail c/o Salamander, 3241 42nd Avenue South, Minneapolis, MN 55406 USA.